Welcome to ProTexting API (Application Programming Interface). You can now easily expand your SMS and MMS marketing initiatives and add your existing tools by connecting to our API. 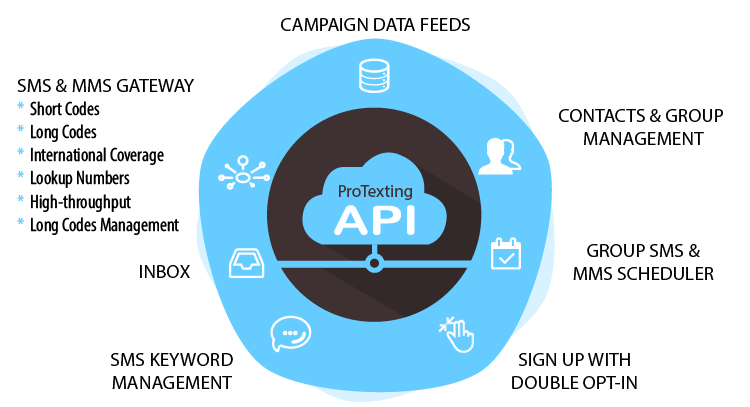 This application provides our clients an environment where they can leverage text message marketing by communicating through our API. API integration allows some of our more advanced users and/or their development teams design and manage their own work flow in the front end, using ProTexting as the gateway to send and receive SMS or MMS messages, manage mobile keywords (check availability, reserve and remove keywords), manage contacts, get data feeds (text 2 screen, direct voting, etc) and integrate a seamless opt-in process. Our API can be integrated in any CRM, Website or Blog or POS system. The process of connecting to our API is very simple and straight forward. You can be up and running within minutes and have a full solution for your SMS campaigns. ProTexting has launched a new RESTful API supporting both SMS and MMS (incoming and outgoing messaging). Lastly, read the documentation and follow the instruction on how to setup your API. What can you do via the API? If you need a simple API Messaging integration using 1 of your Long Codes, checkout our “API Messaging via Long Code”. Before utilizing the app, you will need to reserve long numbers (or long codes) via the “Long Codes Reservation” app. Our local number coverage supports over 35 countries worldwide with 2-way messaging functionalities.